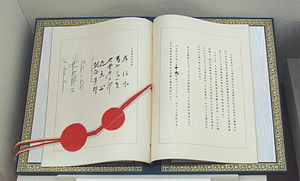 Each Party recognizes that an armed attack against either Party in the territories under the administration of Japan would be dangerous to its own peace and security and declares that it would act to meet the common danger in accordance with its constitutional provisions and processes. ^ a b 五百旗頭真 編; 村田晃嗣「「国際国家」の使命と苦悩」 (2007). 戦後日本外交史[新版]. 有斐閣、198頁・202頁. ^ 国分良成、高原明生 (2013). 日中関係史. 有斐閣.